Pretzel Rod Light Sabers are fast, easy, and perfect for any Jedi-in-training! 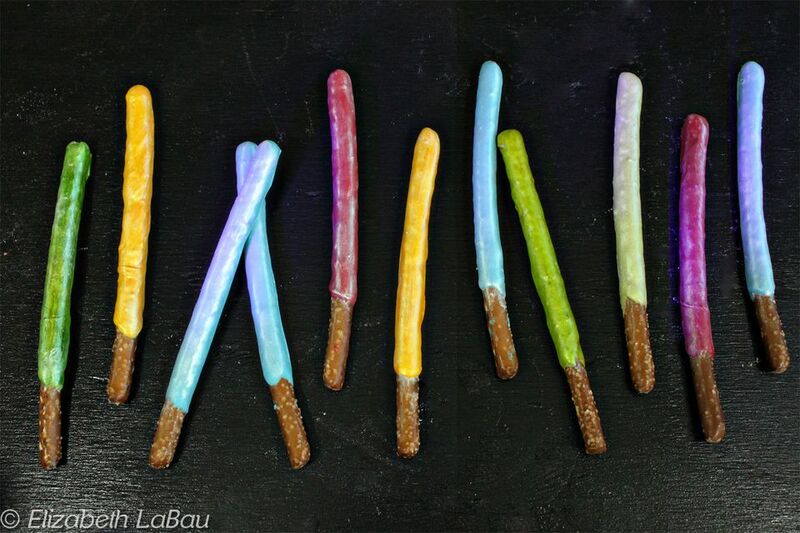 All you need are some pretzel rods, candy coating, and optional pearl dust to get sweet and salty light sabers! The pearl dust is completely optional, but it does add a nice, realistic shimmer to the light sabers. If you want to REALLY see them shine, try them under a black light! Place the candy coatings in separate microwave-safe bowls and microwave them individually in 30-second increments, stirring after every 30 seconds to prevent overheat. Stir and heat until all of the the candy coating varieties are completely melted and smooth. Holding a pretzel rod by the tip, dip it in one of the coatings until almost all of it is covered, leaving about a 1/2-inch section undipped at the top. Place the dipped pretzel on the prepared baking sheet, and repeat until all of the pretzels are dipped. Let the pretzels set completely. Once the coating is set, use a clean, dry food-safe paintbrush to brush a thin layer of pearl dust on top of each light saber. These Pretzel Rod Light Sabers keep very well, so they can be stored in an airtight container at room temperature for up to a month. Note: You can learn more about what pearl dust is. Wilton's brand pearl dust can commonly be found in craft stores like Michael's or JoAnn's. Other pearl dust, like CK Products, is often available at cake decorating stores and online.